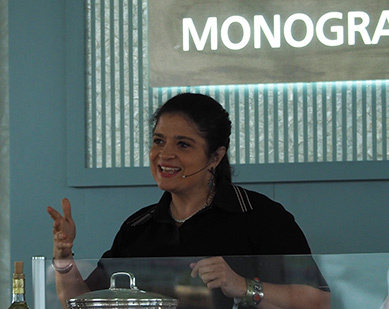 I first had the pleasure of meeting Alex Guarnaschelli (owner of Butter Restaurant in New York City) at a meeting of Les Dames d'Escoffier International, a prestigious organization founded by Grande Dame, preeminent food journalist and visionary, Carol Brock in 1976, as a professional organization of women in food and wine, back in September of 2006. Since then I have enjoyed following her and watching her career grow. 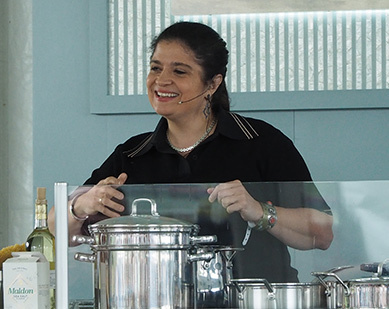 For her appearance at the 2018 Greenwich WINE + FOOD Festival, she demoed how to make Clams in a Puttanesca Sauce and took Q & A from the audience. Personable and engaging, she kept the audience delighted throughout her presentation. Steaming the Clams: Steam clams in 1 cup white wine to 2 pounds of Manila (or Littleneck or smaller) clams, in a medium size pot, cover and heat. Not a proponent of using expensive wine for cooking, she readily uses leftover wine the refrigerator. Add 1 bay leaf to the clams while steaming, do not keep the bay leaf in long - just for a minute or two, to add just a hint of flavor. Chef Tip for Cleaning Clams: Make sure they are closed when you use them. Wash clams in cold water just before using them to remove any sand. Chef Tip: As the clams cook, take them out andset them aside in a bowl. They are like people and need to be treated differently. Do not wait until all the clams open before removing them from the pot. Strain the clam juice to remove any sand at the bottom of the pot. Wipe the pot clean before you add the clams and some of the juice to the cooked pasta. For the Puttanesca Sauce: Cook canned tomatoes, capers, pinch of chili flakes, anchovies, and garlic with olive oil. Chef Tip: Cook the garlic a little before you add it to the sauce. Finishing the dish: Add the cooked pasta to the puttanesca sauce, toss, add the clams, plate, and enjoy. Is it ok to add sugar to tomato sauce? Yes, she does. If you are allergic to shellfish or do not like shellfish, what else can you use in place of clams? You can use a skinned fish filet like porgy or bass to thicken the sauce. Tuna and swordfish are not good to use as they are too dense. The more "low brow"fish are better; let the fish simmer until it falls apart. How long do you cook pasta? Does it have to be cooked al dente? 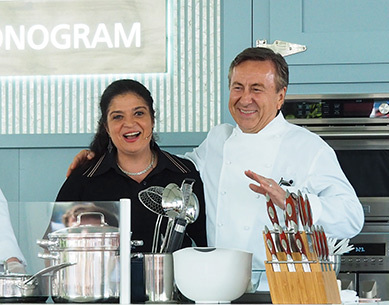 There are no pasta police, you are not going to be Chopped (her television show). She likes to cook pasta just a little undercooked and then finish it in the pasta sauce, however cook it to the texture you like. Pasta is super simple, don't stress about it. Should you add olive oil to the boiling water for pasta? Do not add olive oil to the boiling pasta. Simply add flake or sea salt to the water and stir to keep the pasta from sticking together. At 125 calories for 1-tablespoon of olive oil, do not add it to the water, instead use the olive oil in the sauce to flavor it. Can you add pancetta to the puttanesca sauce? It is your kitchen, if you want to add pancetta, sure, but she does not add pancetta toher puttanesca sauce. What is her favorite meal for a crowd? Large format food like Eggplant Parmor Lasagna, which allows her to spend more time with her guests and having fun, than spending the time in the kitchen when her guests are there. 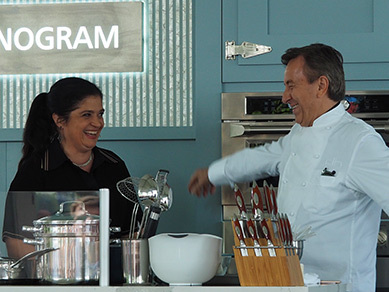 Chef Daniel Boulud delighted attendees by surprising Alex during her presentation, as she had once worked for him. 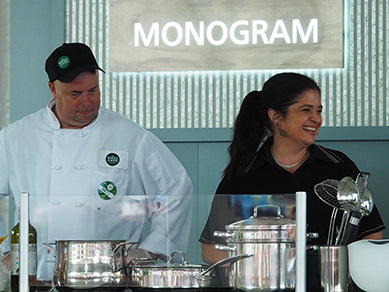 "Greenwich Wine + Food Festival, located at Roger Sherman Baldwin Park in Greenwich, CT, is a multi-day event celebrating this area's rich culinary landscape and showcasing innovation in the food and beverage industries. Year-to-year, it will benefit multiple charitable organizations, including Multiple Myeloma Research Foundation, Greenwich Parks & Recreation Fund, and more." 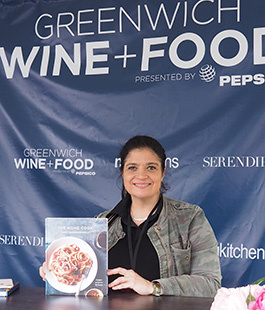 Read about the 2018 Greenwich WINE + FOOD Festival in the Gastronomy section. Also read Adam Richman at the 2018 Greenwich WINE + FOOD Festival in the Gastronomy section.